It feels like every week a new social media tool comes out to make us more collaborative, more connected, more efficient—just more. Two weeks ago it was Chatter from Salesforce, last week it was Conversations by HootSuite. And yesterday it was follow via LinkedIn. B2B companies already use the platform. In fact, 47% of them are on LinkedIn with a corporate page, according to InsideView, and 61% of companies use social media to generate leads. LinkedIn already generates more leads for B2B salespeople than blogging, Facebook and Twitter. So when LinkedIn introduced its new tool, we had to ask, how is this going to further business development and help us sell better? What’s different about LinkedIn’s follow feature is that it enables us to listen, a key trait in sales. 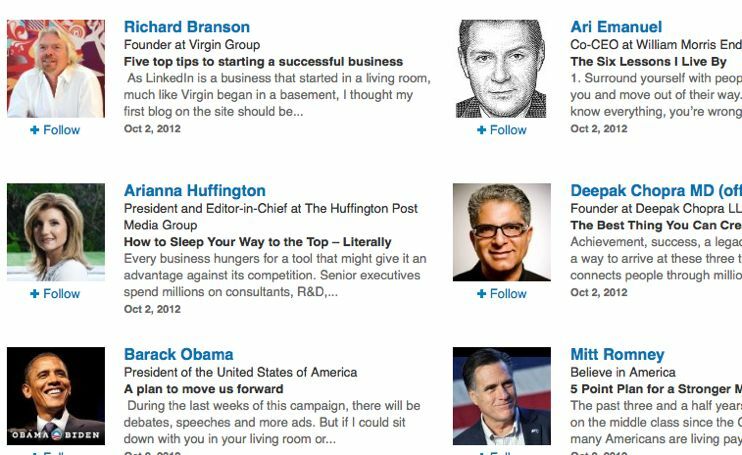 A nuanced differentiation from Twitter’s offering, what LinkedIn has done is give any person the ability to get access to a curated list of thought leaders, influencers and taste makers. But implicit in this grouping is that the social platform has also provided salespeople and marketers insights into the minds of the niche customer they may not otherwise have been able to reach. LinkedIn went through a rigorous vetting process, CEO Jeff Weiner told readers in his blog post announcing the new feature. Not just anyone can be a thought leader. After all, what would be the social currency in that? And in that move, Weiner and team delivered their network of 175 million plus connections deluxe access to a group of impresarios including entrepreneurs, politicians, successful business owners, VCs, media leaders, social mavens, legal eagles, tech gurus, and philosophers. All salespeople have to do, initially, is listen. Read what these people are writing about. Then start asking questions—do your market research. What peaks their interest? Who else are they following? Who are they connected to? Where are they working? Are they seeking advice on LinkedIn Answers? What other platforms are they active on? What’s your in? By giving salespeople this unique way to hear the musings of this incredible bunch of people—from President Barack Obama and his challenger Governor Mitt Romney, from Richard Bronson to Reid Hoffman, from Ryan Holmes to Caterina Fake—with a promise to expand the network, we’re encouraging you to join the listening party. Learn everything you can about this niche crowd, share your insights, and apply to be a thought leader if you have something meaningful to add to the conversation.